Open to U.S. & Canada Residents. 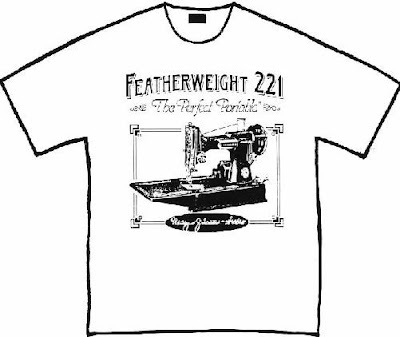 A "Rare" and "Collectible" White T-shirt with the Nancy Johnson-Srebro "Featherweight 221 - The Perfect Portable", size Large. These shirts were made in the day, when Nancy was advertising her 3rd edition of her book, "Featherweight 221 - The Perfect Portable". Yep, there is more. 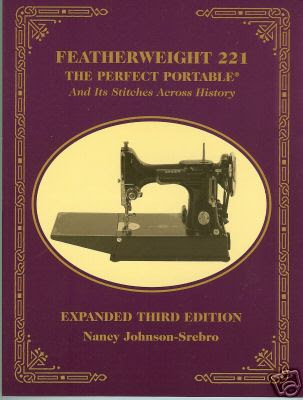 For all of you Singer Featherweight Fans, there is a Nancy Johnson-Srebro book, 3rd edition - "Singer Featherweight 221 - The Perfect Portable". Included in this book are some photos of the oval cabinet that I have, and the crinkle Singer Featherweight Sewing Machine. There will be three separate winners of the latest book. Three winners for this book. Two people could win an even "rare"er (is that a word?) 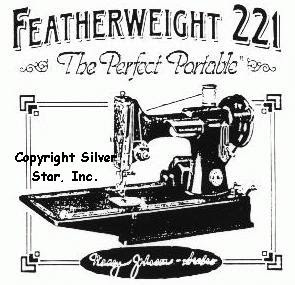 book, Nancy Johnson-Srebro's original first edition of her book, Featherweight 221 - The Perfect Portable. Seen recently for sale on ebay for $25. 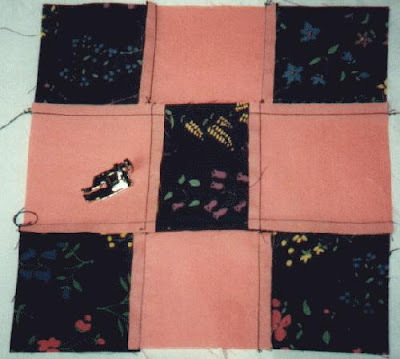 Additionally, three people could win the 1/4 inch patchwork foot, that makes a perfect 1/4 inch seam. Great for putting together quilt blocks and other precision sewing on the Featherweight. There will be three separate winners of the 1/4 inch patchwork foot. How to win? Valid entries (you have to put your email address in the comment and follow this blog) will be drawn through random dot org. It is quite possible that you could win more than one item. But you will not win two items that are the same. Remember, only "valid" entries will win.....you have to do the above two things to gain an entry, then you can go on and get extra entries. Thank you for the opportunity to win some items. I have a 222k which I love and her name is Abigail. Good luck to everyone. My email addy is alancyn7@gmail.com. I am Karen in sunny California. I got my one and only FW from EBAy. I teach Basic Beginners sewing in Adult School. One time I had a student, a guy, whose brother told him he was silly to want to learn to sew just cuz his mother passed away and left him a worthless old machine. I told him to go home and tell his silly brother that his mom's old machine was a collectible FW in immaculate condition complete with everything! thanks for the chance to win!!!! my little FW is called Gwenie, after my mother. she was the one who bought it. they have the same birthdate. 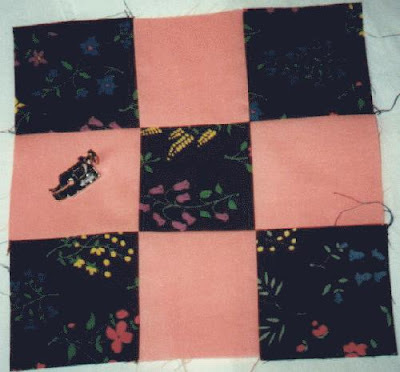 she thought she might take up quilting and then changed her mind. I am the quilter, so now I have it! please pick me! Remember....valid entries consist of following and making a comment, with your addy. Then you can add extra entries!! I am also a researcher and collector for this type of doll. I make other sizes as well. You can see my FW's here. My husband made the cabinets for me. My e-mail address is part of my blogger account so I hesitate to add it here. Anyone can reach me by signing my blog or visiting my Flickr and I like it that way.That's okay if I am not officially entered. Fun giveaway. In a few days I will add it to my blog where I have lots of quilters reading! Good luck everybody! thank you for the opportunity to win goodies..
FW are just adorable, I really love them and this site. Keep up the good work. Great website! Love those Featherweights! Haven't met a FW that I didn't love, even the cosmetically challenged ones! Thank you. conniegreer at comcast dot net. I am anxious to dig deeper into this website and blog. I am the very proud owner and frequent user of two featherweights as well as 1 featherweight card table. My first featherweight is a 1950 named Jane. I love her and she is my primary machine. She just spent a wonderful weekend at a quilt retreat. I also have a 1939 with beautiful scroll work and I call her Grace. To make my sewing nice and easy, I even have the wood-top card table for my featherweights. I am totally in love and can't imagine piecing on anything else. I love your contest! I am usually a lurker to gather information but just like a college class that grades on class participation, here I am!!! My FW is called Bobbie. I had another called the Phoenix but she moved away. I have a centennial FW and just love it! Thanks for your giveaways! Yay o yay!!!!!!!!! I love love love love love Singer machines! They just make me happy all over! Dare I even think about winning?? I am the very proud caretaker and user of two featherweights. My first featherweight I purchased nearly a year ago. She is a 1950 black beauty named Jane. Then this fall while hunting Craigslist I found a 1939 beauty as well as the wood top Singer card table for the featherweights. My 1939 scrolled beauty is named Grace. I do all of my piecing on Jane and she is always true to me. I am just so happy with my beauties. I look forward to learning more about this site and finding fun things for my featherweights. Posted a link on my site and am giving the giveaway a post on my main page! I have seven vintage Singer machines now. My grandmother's 201 machine in the original cabinet w/drawers on the right side, and boy is that heavy to move. I've hemmed many pairs of jeans on that machine, and it still works perfectly, has the buttonholer and all the attachments. Once ebay emerged I saw my first Featherweight there and sighed. Of course I wanted one, but hey were definitely out of my price range. A few weeks before Christmas 2008, I stopped at a yard sale on the side of the road on Route 5 in Hughesville, Maryland. She said: Oh no, I have $50 on it and I can probably sell it on ebay for more. Gulp..I was thinking I needed to put her back on the table and say goodbye... Then I heard her say, I'll take $30.00. Still contemplating, because of the economy and knew that it's certainly not a necessary item, like bread and milk... I remembered I hadn't bought a present for myself for Christmas yet, and this would be the perfect gift! I quickly paid her and ran to my car with my treasure with a huge smile on my face. Once home I downloaded the manual & oil guide, (thank you out there in cyberspace for offering it for free), and proceeded to clean her up. It was covered with a dark grime, looked like tobacco, but it didn't have any odor. Perhaps someone had coated it with oil and it had just collected so much dust. It cleaned up pretty well with some love and elbow grease and now looks great to me. A new belt and little red felt thread pads were all I needed. It had the original brown marbled bakelite foot pedal too. The cord is a little tattered, but so is my 201's. It sewed a perfect little seam and I squealed with delight. Perfect she isn't, there are several pin scratches and some small rust bubbles and some of the decals are worn off, but she works flawlessly, and I don't have to worry about messing her up. I am contemplating doing a little touch up and perhaps some new decals in the future, if I ever have the time. My other Singers (and it's time to unload a few I think) are the Slant 403A, Slant 503A, three 185's - two are green and one is a blue teal color from Canada really cute color, and my dear 201 from my Grandma Becker. Five machines I purchased at a thrift shop for $10.00 each. The man who donated them was a quilter. I also purchased several boxes of attachments for $1.00. And in that lot was a box with FW attachments. Total invested in all my machines is about $90.00, you can't even buy one good machine for that. I do all the repairs myself, but have found they never seem to need anything. I donated my Singer Merritt last month, it was always getting out of timing. There is DEFINITELY something to be said for the good old Singers for sure. I have a photo album of my machine on the FW group on Yahoo, Luckpea2003 Sue's Featherweight, who I named her Lillian, after my Grandmother. Opps! I mean the LEFT hand side of the blog.....ewww. I really don't know my left vs the right, except when threading my featherweight!! Right below the "Link" button. That is the "follow" section. Gotta follow with your email or explanation of why you don't do email in order to be a "valid" entry. I recently bought my 1st Featherweight, a white one in great condition. She's a beauty! I haven't sewed on a Featherweight since 1978 when I was working/sewing for my future MIL. It's better then I remember! Thanks for all the great info! I'd love to be entered and I am now a follower. Very generous giveaway. I would love to enter. I can't wait to tell my aunt about your blog. She's gonna love it. Kim in NYC. My latest project using my beloved FW was a KING size wedding quilt made for my DD. My daughter and her husband married in Ireland and I had a reception for her when they returned. I had people sign a muslin block with their names and then another block with their wishes, or advice or whatever on a separate block. I used Dublin Steps for the pattern. I still have to handquilt the monster, which I plan on starting soon. DD has not seen the top yet, I think I will wait till it is finished to let her see it because I think the quilting makes the quilt! My email is westienut at hotmail dot com. Thanks for another opportunity to win, got my fingers crossed!! Just found this blog--what a wealth of info about Featherweights! Thanks for the opportunity to win. I am the new owner of a Featherweight. I purchased it for $75.00 and it is in good shape. I added a 401 Singer to my collection recently too. I forgot to add my email address to the previous post. Sorry about that. I forgot to mention that I have a 301, too, and a Montgomery Ward free-arm machine that is as light and small as Featherweight. Time is running out...exciting give away! Good luck everyone! Well I'm new here. I have had my Featherwieght 221 for years and used it for many things- I used to carry around working on films for costumes and drapes and myriad project. That one got stolen and I got another one and am now making hats and quilts. I'm in love with my FW and my heart tingles whenever I open the case to set it up. I also live in a tiny NY apartment so it's the perfect machine for me! I am starting to build up a more complete set of parts. lelizd33 at yahoo dot com. Greetings everyone, I look forward to posting here and joining the fun! I'm giving a Featherweight to my daughter, and when she graduates from college and goes either to New York or Chicago to dance, I hope she'll use the machine. She's already reconstructed some t-shirts, so she might like to sew later on. I was purchasing some vintage patterns at a thrift store, and a lady in the line said to me, "You mean there are people out there that are still sewing?" She was in her late 60's. I really have enjoyed sewing on my fw and hope to never be without it. Glad to have found your site and having fun reading all the messages. My parents found my FW (1934 birthyear) for me the day after I told them to keep an eye out for one. They shipped it to me and I've used it so much during the past 10 years piecing quilts. I recently got the wooden card table and even though it's missing it's insert, I don't care because my FW is in it all the time. Thanks for the giveaway. I TWITTERED about this give~away.......user name: leahita. Whoooo Whoo! I can't believe that I won.... and twice!!! Thank you so much, I am so excited! I really appreciate this!